A storage building is an addition to your yard that you can make whether you need extra space for all of the things that won’t fit inside your home or if you want to better organize all of the tools and other items used outside. You can find sheds of all sizes and designs to suit your needs. Keep in mind a few ideas to organize your space once the building is set up in your yard. An easy way that you can keep your shed from getting unorganized and messy is to install large hooks on the walls. These are beneficial for gardening tools that have handles as well as chains and ropes. With hooks on the walls, you have more space on the floor of your shed for equipment and boxes. When you look at storage buildings in Kentucky, you will likely see that they don’t have any kind of shelving system. You can install any kind that is suitable for your needs once you get the shed home. A sturdy rack system made of steel is beneficial for heavier objects. 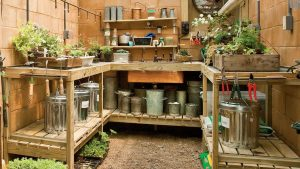 However, a simple rack system made of other materials that will hold the items in your shed is sufficient as well as long as you secure the racks to the wall so that they don’t fall. One of the ways to organize your shed or storage building that you might not think about is to install a magnetic strip on one wall. This strip can hold some of the smaller metal tools that you have so that you don’t lose them. The magnetic strip could be installed on a pegboard to keep all your tools and the supplies in one place. You won’t have to worry about hooks and other accessories that hold tools on the wall with a magnetic strip. The containers with handles on them or those that you no longer use can be refurbished to hold all of your small tools and the items that don’t seem to have a place to go in your shed. Make a container with all of your gardening supplies or a container with tools that you need to have ready to work on your car. Examples of the containers that you could use include flower pots, baskets, and planters that were once on windows. Not only can pallets be used to keep items off the shed floor, but they can also be used to organize long tools. Stand a pallet on its side and put tools like a shovel or a rake inside the pallet. This will keep the tools from falling over and will help to keep them separate from the other items that are in your shed. You can add divisions to keep the tools from hitting each other or falling over onto each other while they are standing inside the pallet, keeping them in the best condition possible so that you can use them to manicure your lawn and garden.